The Romanian cuisine includes a wide variety of soups. 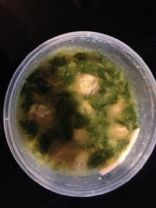 There are two kinds of Romanian soups: "supa" and "ciorba", the latter referring to recipes that have a distinct sour flavor to them, given by the "borsch". The "borsch" is a fermented wheat bran that is added to the different soups at the end of the preparation. 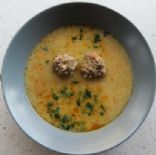 The Romanian Meat Ball Soup can be also prepared with ground chicken or pork. The vegetables used can vary, but the carrot, celeriac/parsley root and onion are always necessary. Some people add diced potatoes or noodles at step 3. The flavor fix up at the end is optional. Lovage is a spice herb somewhat resembling the parsley, but its leaves are bigger and its flavour is different. 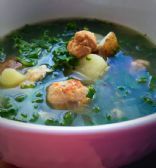 Hearty and filling Kale and Sausage soup. It's perfect soup for the summer to fall or winter to spring season.